This scene takes place when Charlotte and Lyle find shelter from the rain in a hut on the Warren estate. Charlotte has just confessed that one reason she doesn’t want to marry is that she’s already suffered a disastrous engagement. Charlotte waited for Lyle to express surprise or sympathy, but he remained quiet. His lordship was a good listener, she’d already noted, with a talent for making the speaker feel like they received his complete attention. It was infernally appealing. “I was very young,” she went on, before she’d even decided to share the story. “I assume Ronald is the fellow responsible for the nice kisses. 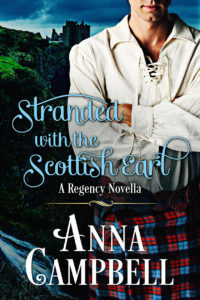 I almost pity the poor sod.” Lyle’s hand curled around hers where it pleated her skirt. More warmth. Just as irresistible as the soft Scottish voice. Thank goodness Lyle didn’t follow up on her betraying remark. The last thing she needed was him guessing how much she found about him to admire. And he hadn’t even kissed her today. Guilt rose to choke her. It always did when she thought of how shamefully she’d treated Ronald. This was why she hated revisiting her brief engagement. Unable to sit still any longer, she surged to her feet, breaking Lyle’s hold. “No, not so much in a bride,” she said in a subdued tone. “Are you?” she said doubtfully.